Happy Independence Day. Today We Remember. As we celebrate the birth of our nation, please take a moment to honor the brave men and women who fought for our independence and all those who came after them. We honor the men and women in foreign lands today who continue to sacrifice for our life, liberty and pursuit of happiness. 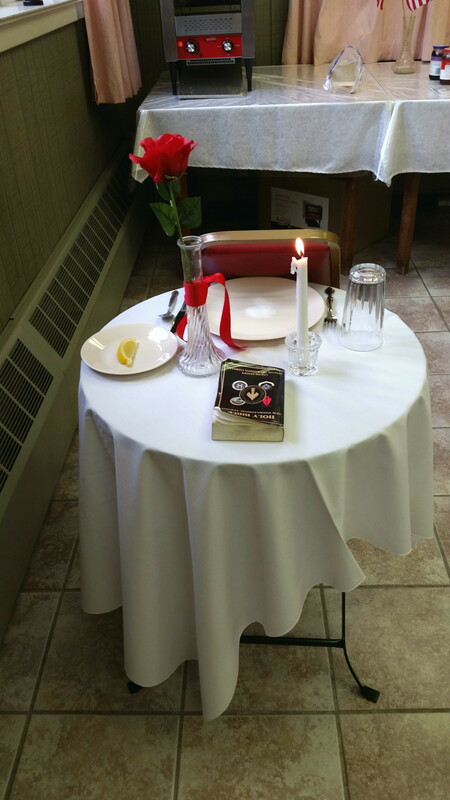 The Missing Persons Table honors those men and women who are not with us to celebrate today.. The table is round to show our everlasting concern for our missing men and women. The tablecloth is white, symbolizing the purity of their motives when answering the call to duty. The single red rose, displayed in a vase, reminds us of the life of each of the missing, and their loved ones and friends of these Americans who keep the faith, awaiting answers. The glass is inverted to symbolize their inability to share today’s toast. The chair is empty — they are missing. Let us raise our glasses in a toast to honor America’s POW/MIAs and to the success of our efforts to account for them. And let us not forget all of the brave Americans who paid the ultimate sacrifice. May God bless our military heroes and our nation today and always.